Today is the last day of term 2, This afternoon we break up for our 2 week winter holiday.During the break I have a lot of administration for the school to complete ( finishing our eSmart plan, completing my personal performance plan, updating our school management plan and preparing learning tasks for term 3) over the break and some chores to complete ( carpet cleaning, gutters to clean out and the air conditioner to service) Hopefully somewhere along the line I can have a rest and catch up on some reading. I think I'll also give blogging a break after this weekend. We had a lovely sunny day today. 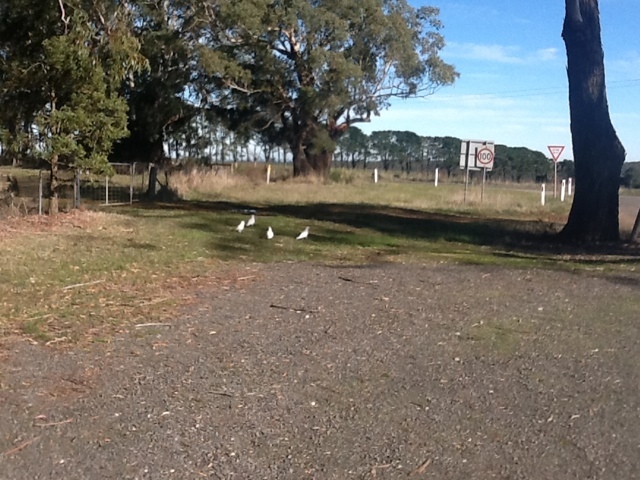 In the photos I took today you can see some white cockatoos who were picking at seeds in front of the school. 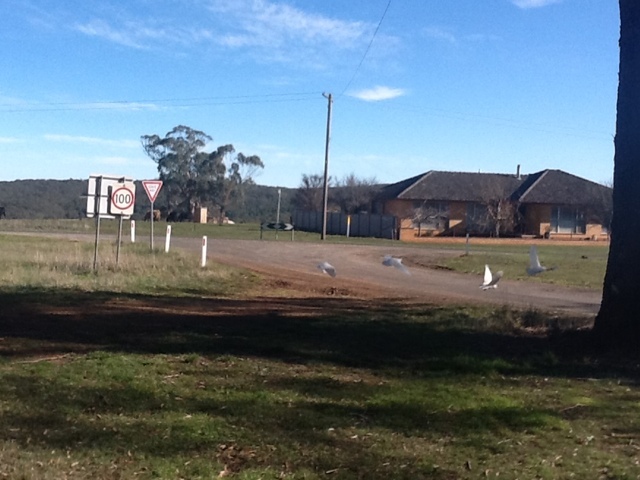 I scared them.There is also a photo of the school from across the road. 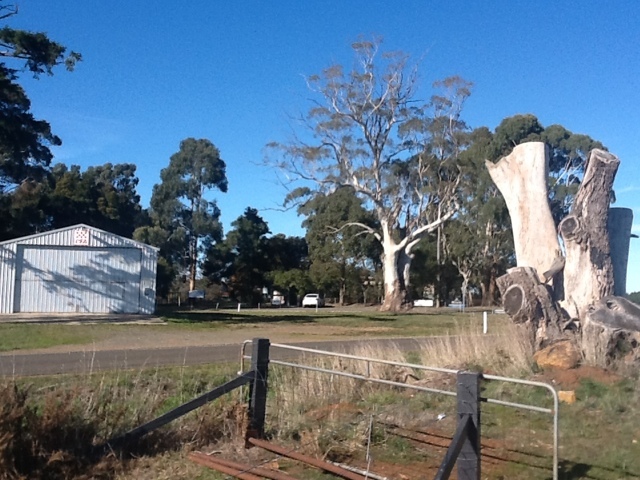 The CFA ( Country Fire Authority- volunteer fire fighters) shed is on the left. 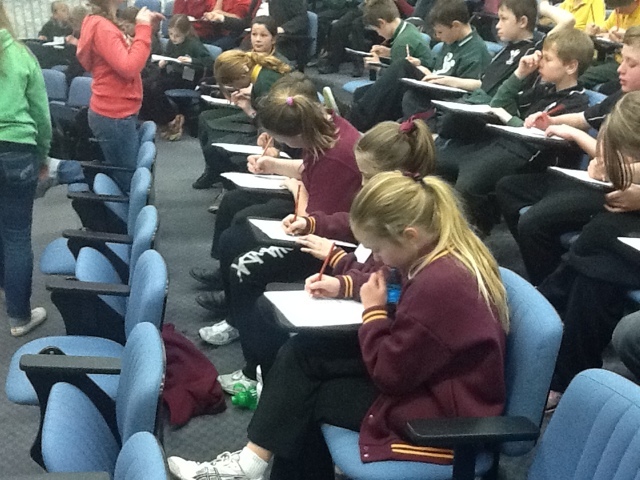 today my grade 5-6 students went to ACU ( Australian Catholic University) along with 3 other small schools near us to a careers day event. 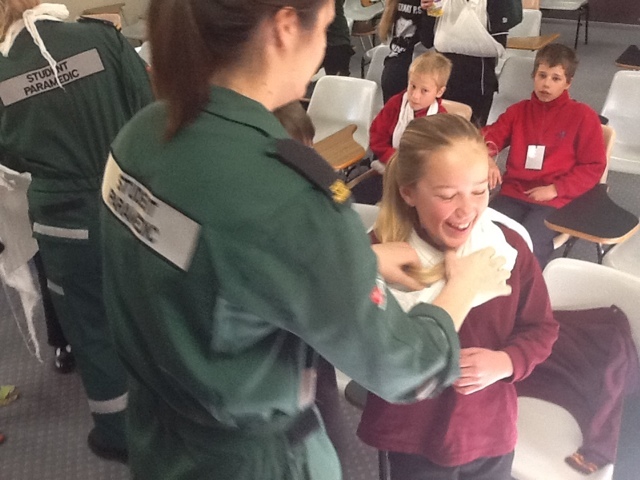 Children had the chance to meet students who were studying at ACU ( nurses, paramedics, teachers and personal trainers) The day was very well organised and the young students who presented to the children did a fantastic job. 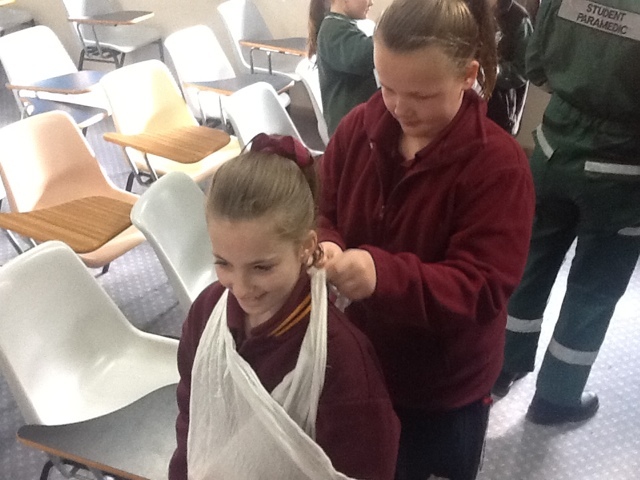 ( refer to the photos below where our children are practicing their first aid skills with paramedics) The great thing about these group days for me is that I get to see children from other schools in action and that always makes me feel better about my school and my students.After the presentations by the students we met in a lecture theatre for a de-brief and then had a huge lunch. After lunch I took the kids to Book City for them to select books to read over the winter holiday break. 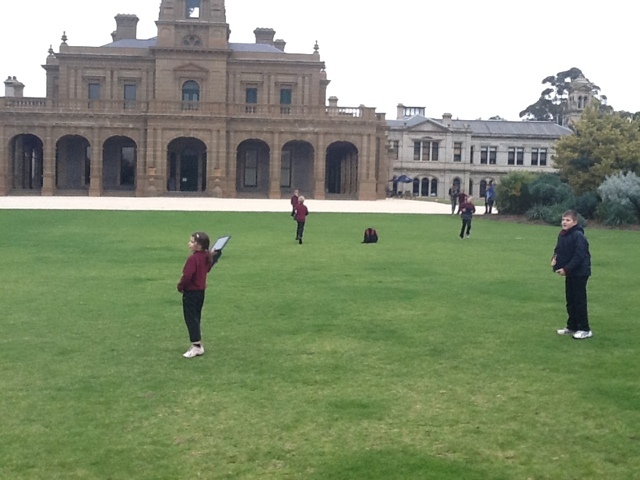 we also had a tour around historic Ballarat Railway station. 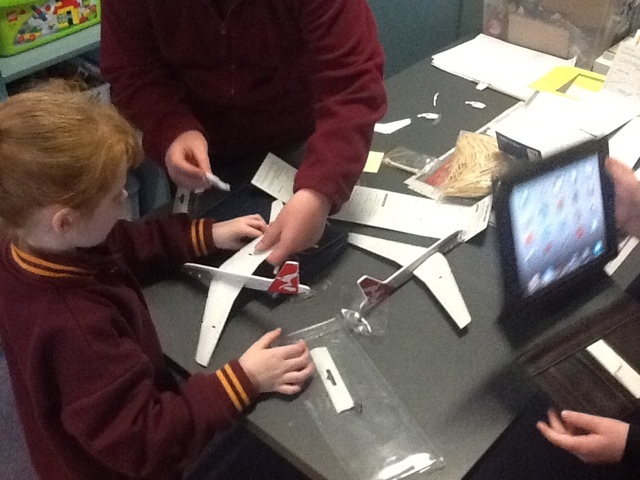 My prep( Foundation/ kinder) girl has been studying the letter 'j' this week so I bought some QANTAS cardboard cut out jumbo jets to make and fly this afternoon. My grade 6 girl did some peer tutoring with my 2 infant students ( she has more patience and construction skills than me) and she and they both did a fantastic job.After finishing them they went outside and did some test flights. 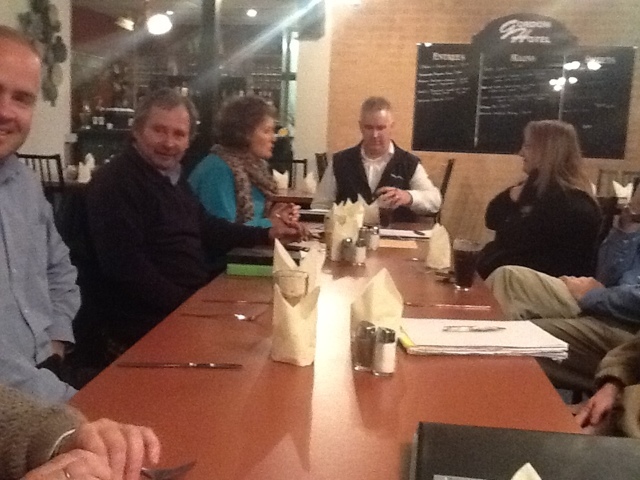 Tonight I attended our Moorabool Network meeting. 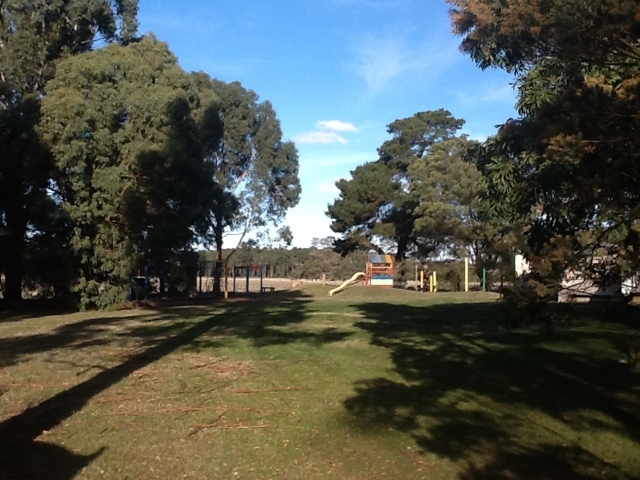 (The Network comprises 15 small rural schools around Ballarat ) at Gordon Hotel ( refer to the photo below) The Network provides our schools with the opportunity to gain valuable collegiate support in a supportive and trusting environment. We discussed a range of issues and enjoyed a drink and dinner. 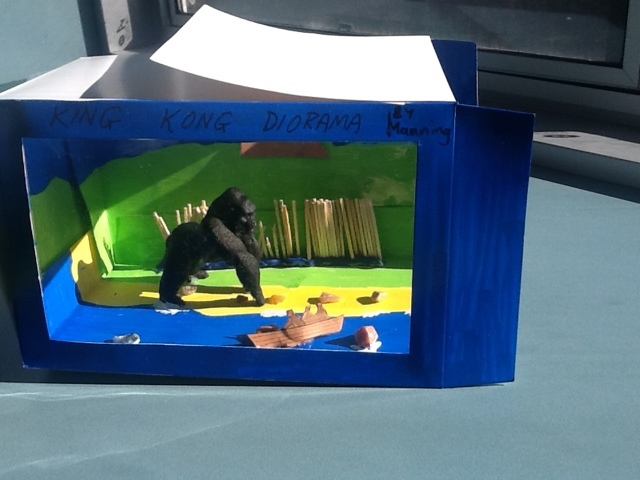 One of my students was finishing his KIng Kong diorama today. Match sticks were used for the Skull Island wall while a plastic toy was used for King Kong. Set to peak on Sunday, June 23, the 2013 supermoon is noteworthy not only for the remarkable sight it will present to skywatchers but also because it will be the largest supermoon this year. Also known as a perigee moon, the event occurs when a full moon lines up with the Earth and the sun at a specific point in its orbit, called the lunar perigee. That's the point at which the moon is nearest to Earth as it traces its elliptical path around our planet. Since it's closer to us, the moon appears up to 14 percent bigger and 30 percent brighter than usual. 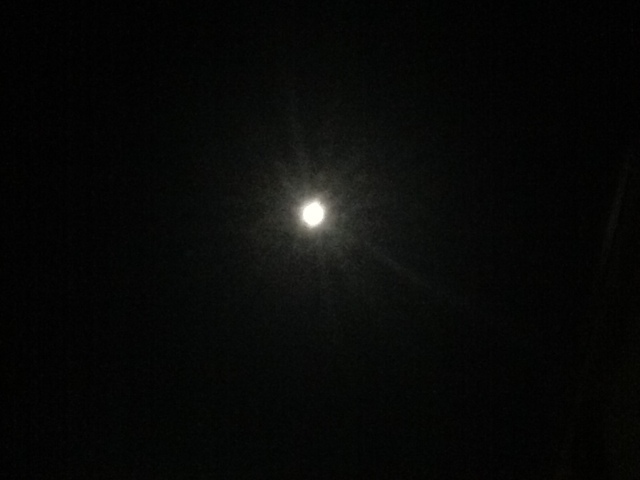 Coined by astrologer Richard Nolle, the term "supermoon" essentially means a bigger and brighter full moon. While skywatchers will be able to spot another supermoon in July, the moon will not be this close again until August 2014. My daughter took some very artistic 'moon photos' for her photography class but my weak effort with my iPad camera is pretty lame ( refer below) So if you are reading this now, I suggest you pop out side with some binoculars and enjoy a great view. 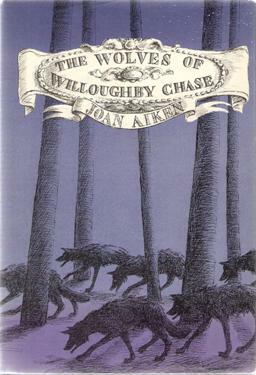 TheWolves of Willoughby Chase was the first of Joan Aiken’s twelve books that formed her famous Wolves Chronicles. The books are set in an alternative England ruled by good Stuart Kings in a Dickensian England tormented by roaming wolves and where travellers ride in steam powered vehicles and hot-air balloons. 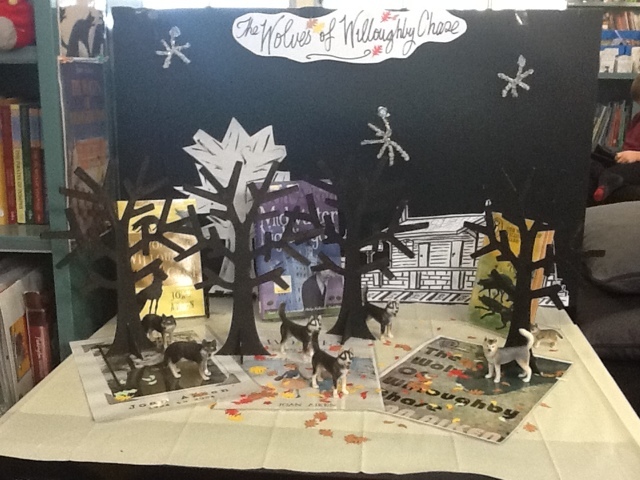 (Steampunk) The Wolves of Willoughby Chase is an excellent introduction to her work and always seems to be an instant favourite with children that I’ve read it too.I will be reading this book as a serial to my students next term. Click HERE to go to my TPT shop to purchase this unit. 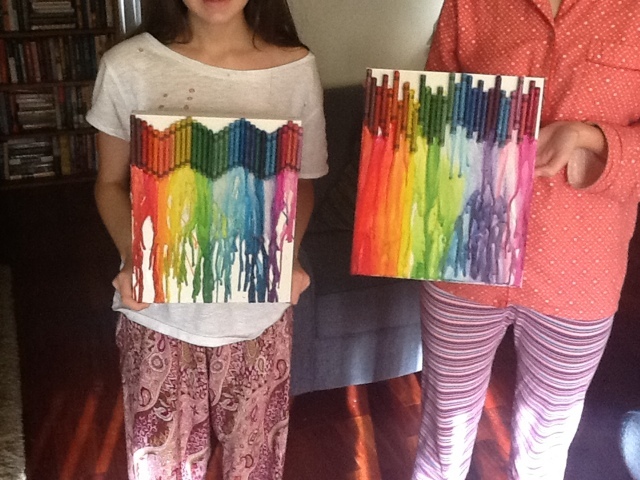 Below is a photo of the melted crayon paintings the grade 5-6 girls at my school created on Friday. They are supposed to show King Kong ( they glue gunned plastic toy gorilla's on the canvas) bursting out of the forest on Skull Island. They didn't do a bad job. 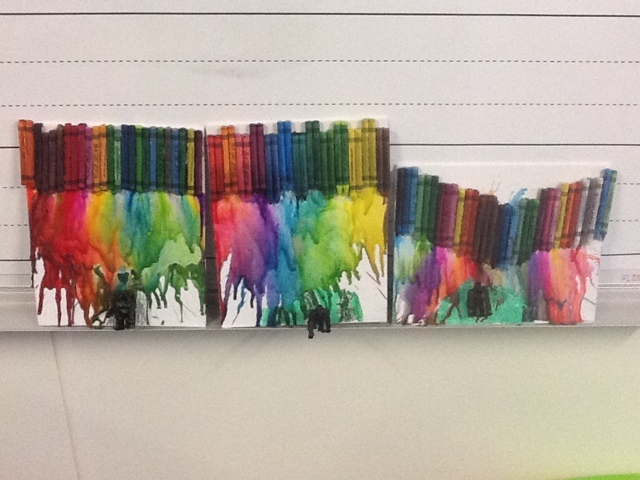 We have left over crayons so they can have another go at it this week. 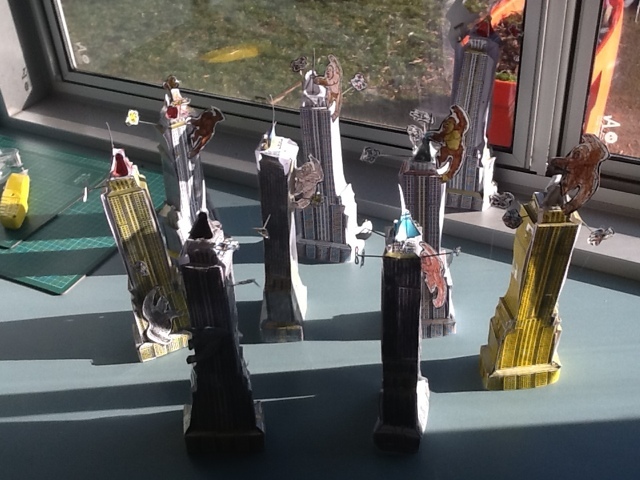 The kids had a great time at King Kong yesterday and today back at school they completed their Empire State Building models ( Some were a bit wobbly...more like the leaning Tower of Pisa) and started art responses to the story. Crayon melt pictures of King Kong in the jungle of Skull Island and dioramas of Kong bursting through the wall.They also completed puzzles and quizzes I developed and created some of their own using Discovery Puzzlemaker. We watched a bit of the original movie ( colorised) on You tube and finished reading the novel. 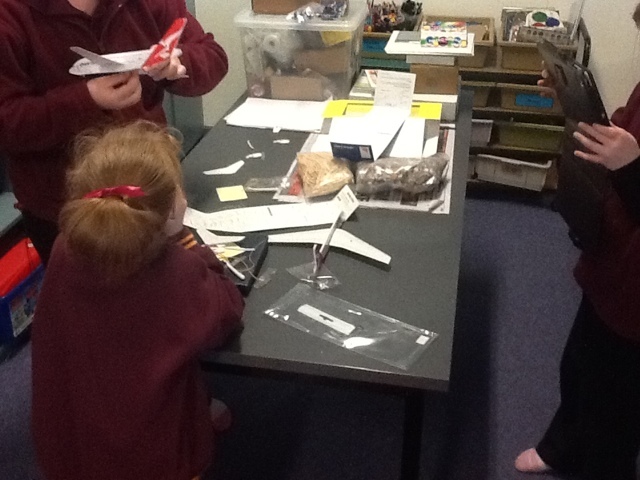 later we'll make some plastic models of bi-planes like the ones in the movie. It was very chilly today. I think it got to 9 Degrees today but the sun popped out which made it one of those beautiful crisp winter days in the country. I got the grounds mowed today, the school always looks better after that. 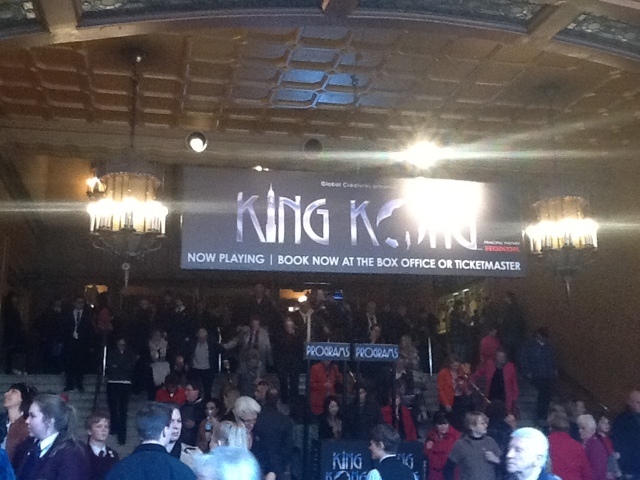 Just been to the Regent Theatre in Melbourne to see the new musical of King Kong. 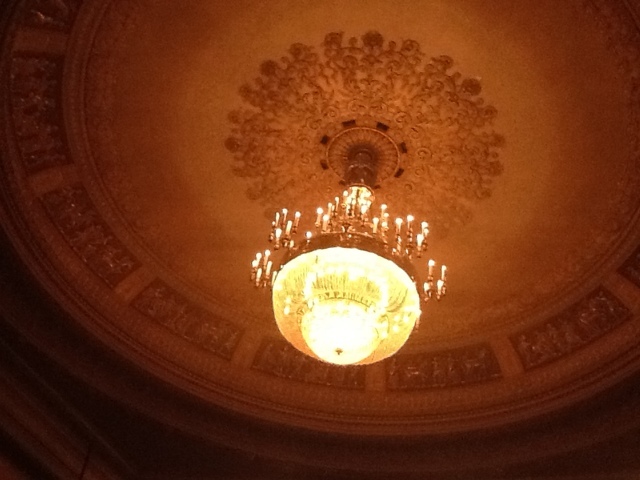 the Regent is a beautiful old theatre. It is hard to imagine that they nearly tore it down in the 70s. 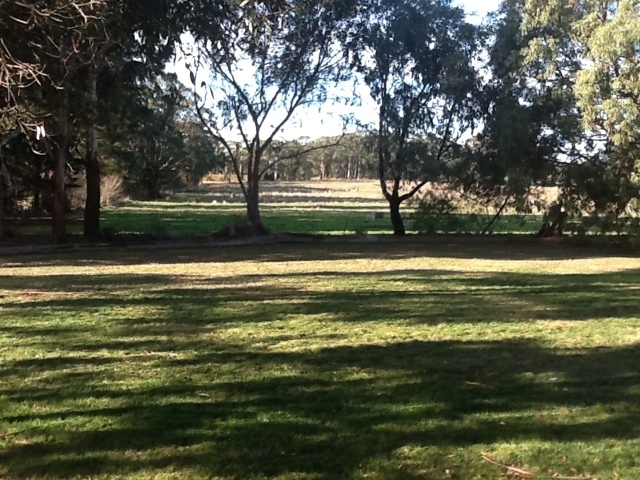 ( Saved by union 'green bans' which stopped the developers in their tracks. )I took a photo outside and the fantastic roof with its chandelier. I took other photos but the iPad camera isn't that good and the theatre people get a bit nasty if they see you taking photos.The kids thought it was the best thing they'd ever seen! So if it ends up touring in your part of the world then go and check it out. 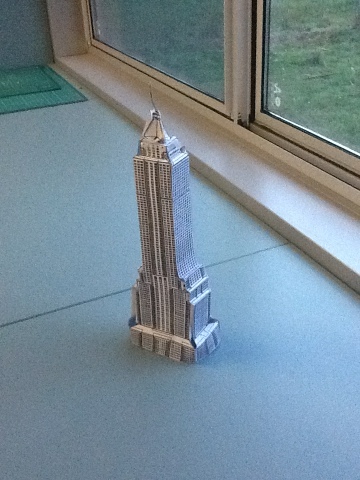 We are making Empire State Building models at the moment ( Link to the free model in my King Kong unit plan) Mine is a bit wonky. 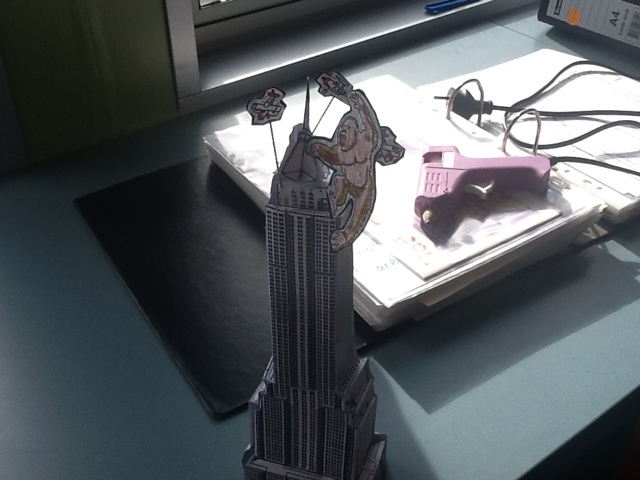 I added King Kong as well as some aeroplanes ( glue gunned on) The model is a bit challenging to make. I wouldn't attempt it with any grades below 5-6. 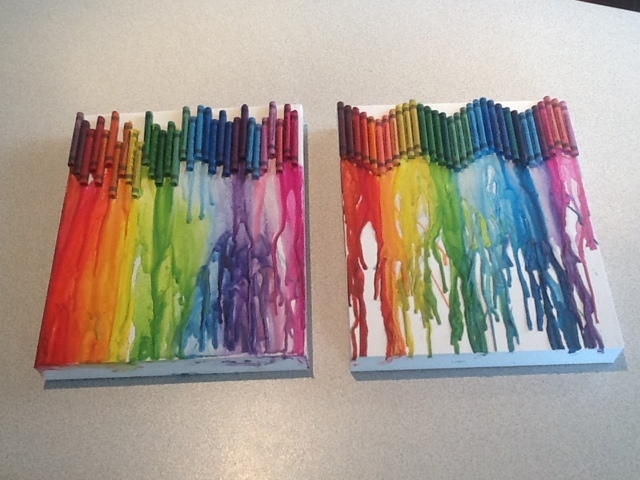 I saw this on Pinterest recently ( apparently it has been around for ages) You glue down crayons onto a canvas frame ( Use a glue gun) and melt them with a hair dryer. 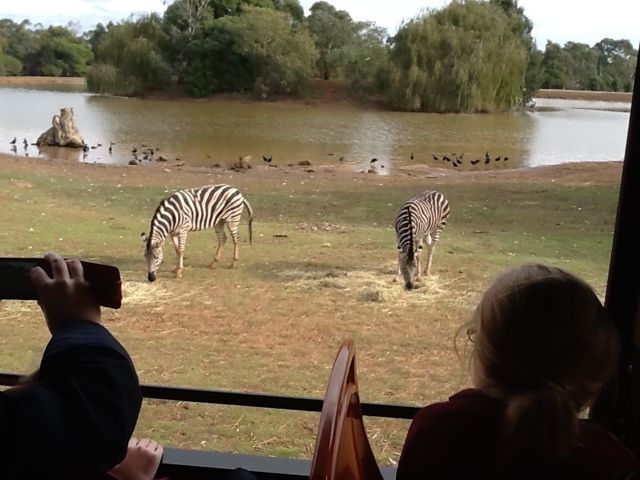 ( My daughter and her mate did it the other day- photos below) and filmed it on her iPad so I can show it to some of the kids at school who will hopefully have a go at it in art this week. Photos will follow. One of my students just finished a unit on Treasure Island and Kidnapped. 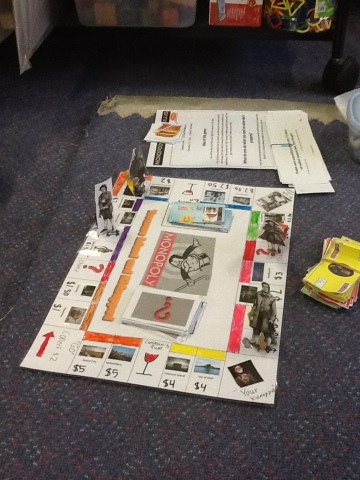 (See an earlier post) and has been working on a board game based on the books. I've been able to give him extra time and resources to complete it. He has 'road tested' it a few times and it seems to work well. Also just 2 more weeks before the winter holidays. We were busy at school today. 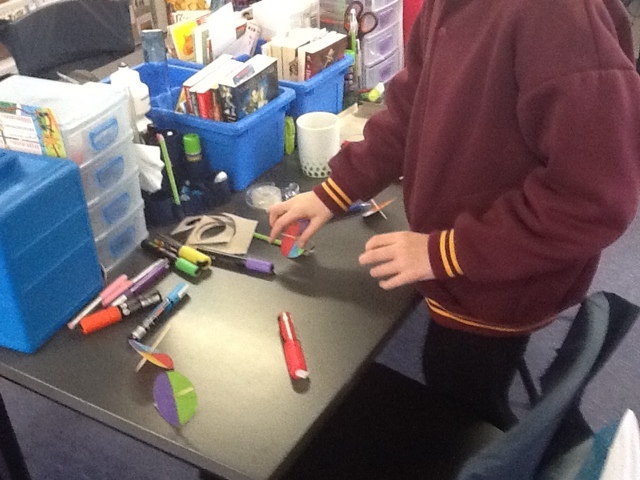 During maths one of my students was experimenting in chance and data with a coloured spinner. She got a bit carried away and ended up creating a bit of a 'production line' of coloured spinners to experiment with. 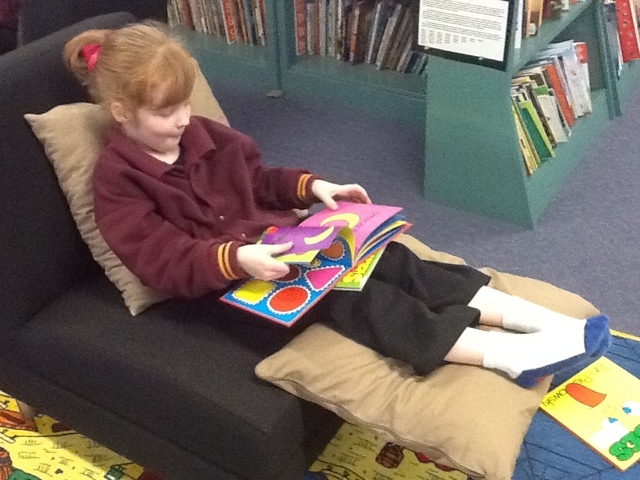 Another student made herself very comfortable while reading and another one was watching documentaries on YouTube after reading a story ( From the excellent 'Treasure Trackers' series from Blake Educational) about Captain Kidd's 'money pit' on Oak Island. Here at Glen Park we are able to give children the opportunity to learn at their own pace and to give them the opportunity to immerse themselves in their learning. 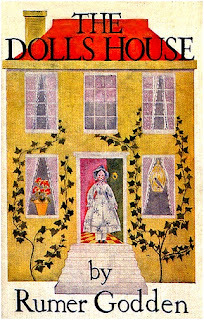 The Dolls House was written by renowned English author Rumer Godden after World War Two. She wrote popular award winning novels for adults and children and The Dolls House is one of her best known. It has been in print since 1947. 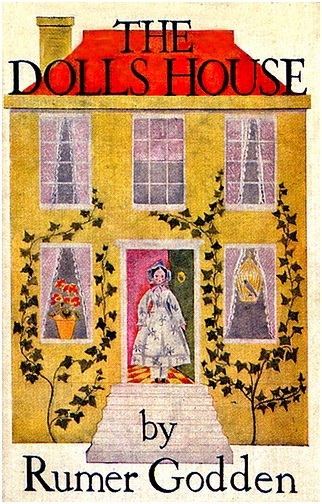 There are many books based on the world of toys and dolls (The ‘Velveteen Rabbit’, Noddy, the superb ‘Mouse and His Child’ as well as the subversive Sock Monkey stories by Tony Millionaire) but The Dolls’ House is in my opinion the best example of its kind. This is the tale of a doll "family," with nominal family type roles who are thrown together by chance. The real head of the household is Tottie, a wooden farthing doll, who remembers Queen Victoria on the throne and is wise beyond her childish appearance. The dolls' domestic happiness and the way it is threatened by the appearance of Marchpane, a ‘unique’, arrogant and, as it turns out, very malevolent. I will be teaching this unit this term and think the girls in particular will enjoy it. 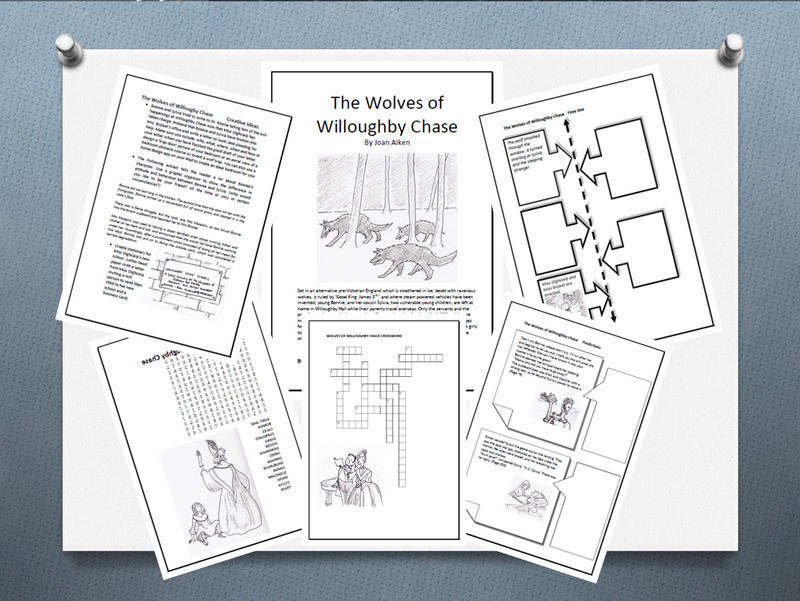 CLICK HERE to go to my TPT store to download this FREE unit. I had a bit of a rude welcome to school this morning. I usually pop up early on Saturday morning for 5 or so hours to do the admin and get a few things organised for the following week. 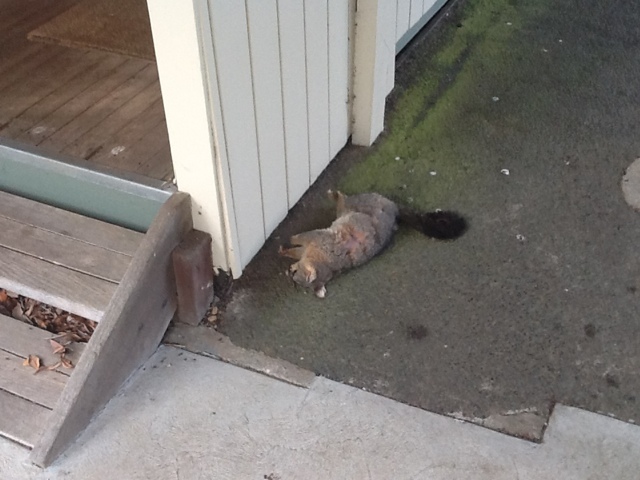 This morning ( thankfully I was a bit late because usually it is dark when I get there) I went to turn the corner to my classroom and there was a dead ring tailed possum on the ground. It was quite big and quite dead but no outward sign of injury. I've found a dead one before which fell from a tree but this is a bit of a puzzle. Other dead animals I've had to bury include a fox, a few parrots and magpies and last year an owl which I think must have flown into a window and broke its neck ( We had a few of those when we got our new building) It's just one of the little joys of teaching in the country. Yesterday I had an email from Hannah, a teacher in England interested in a unit plan I created for Dinotopia. James Gurney ( the author/ illustrator of the Dinotopia series) had a link on his blog to my school website but I had to take the unit down from there as it is hosted by the Education Department and they have size restrictions - which I had well and truly exceeded. 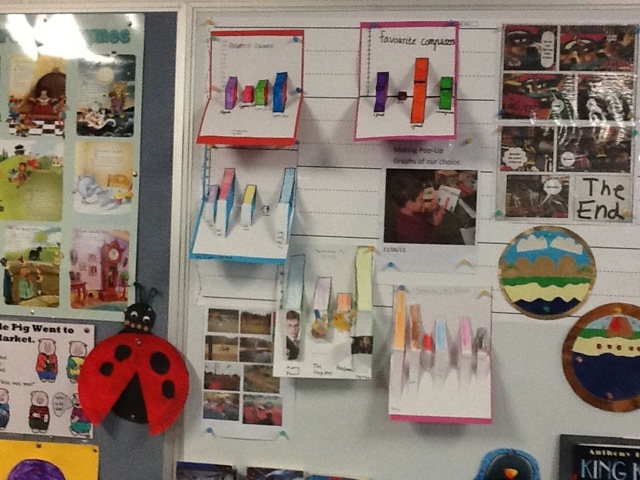 Instead I'm gradually putting my unit plans up on TPT ( At my current rate it should take 10 more years to get everything on) and making a link on this blog. A lot of what I put up is free and the price of other items is very low compared to some. Feel free to have a look. 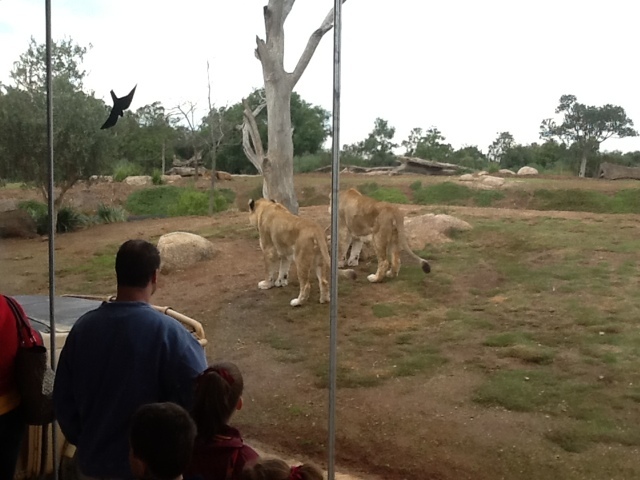 if you become a follower and email me ( shaw.anthony.n@ edumail.vic.gov.au) I'm happy to help. In the next half of the year I intend to trial using our iPads to deliver LOTE ( Languages Other Than English) I attended a PD today which I hoped would help with that. t wasn't quite what I needed but I did learn a bit about some great apps that can help with LOTE an other subjects. 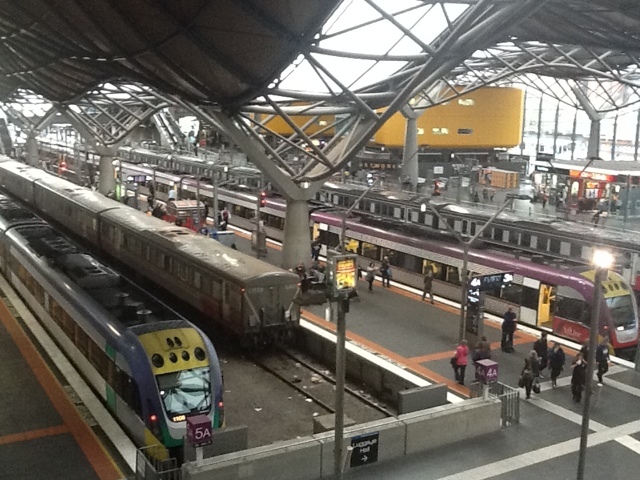 The PD was in Melbourne so I travelled up there by train. 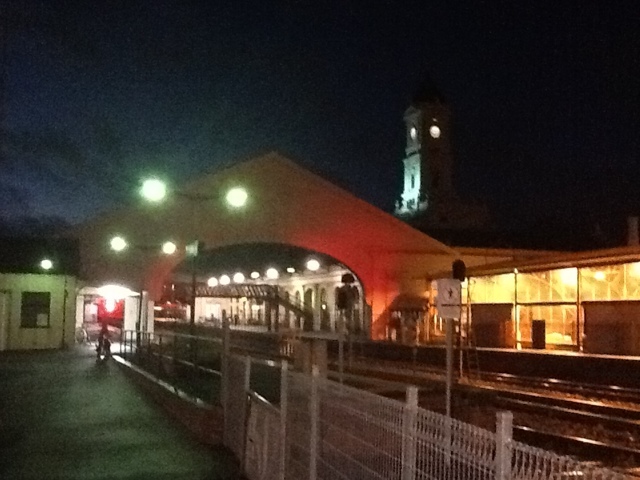 ( I took a photo of Ballarat Railway Station early this morning in all its Victorian glory and another one of Southern Cross Station in Melbourne.I also took a photo of our PD which is below along with my notes from the day. PS- 3000 visits tonight. Thanks for stopping in and having a look. Hope I'm, if nothing else entertaining! Don't forget to add comments and become a follower. 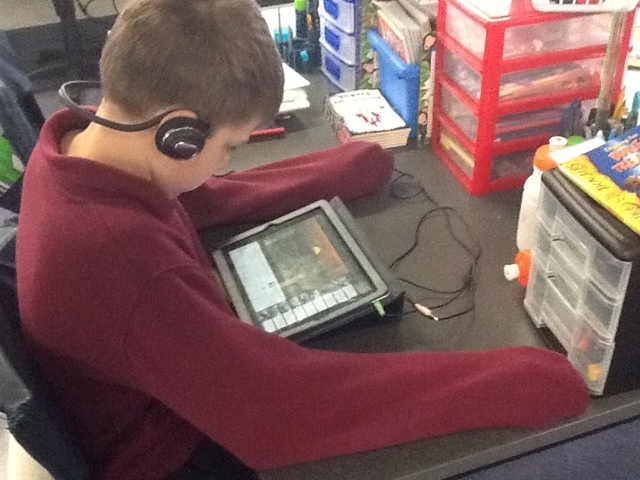 The iPad can provide: feedback, repetition, student talk time, real communication with target language speakers. Saving an sharing work- need to have reliable access to work produced by students. Great online quiz activity for a whole class using the student paced quiz. Results can be emailed as a spreadsheet.Questions can be short answer or multiple choice or a game called 'Space Race'.- use the online version to set up quizzes. Teachers use the website to create the quiz and students should use the iPad. QUIZLET also contains games as well as flash cards. Children could use it to create their own lists and to practice it themselves or share it with other students.This app is reasonably easy to use. Edmodo is another app that can be used to make a quiz and for formative assessment.These quizzes can be done at any time and from home. For uploading videos Rebecca recommended Drop Box. QR Codes from the Barcode+Free app was explored and although time consuming to prepare looks like a lot of fun.Rebecca set up some QR Codes for us to explore with our iPads. Make Dice Lite: This is a simple game. You can put words on dice that they roll by shaking their iPads. My next task in introducing LOTE to the classroom will be to ask children what they want to learn ( from a short list) and then find some suitable apps for them to work with from early next term. 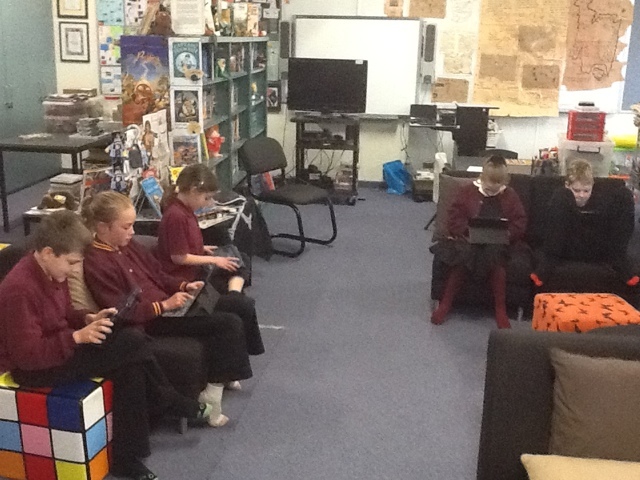 I will provide them with three half an hour sessions just before lunch time to explore their apps. They will be asked to create a 'presentation' ( Including a teaching tool of their own design using iPad apps mentioned in this report ) at the end of the half year to show what they've learned and we ( myself and the students) will consider the future of the approach for 2014. They can use QUIZLET to make their own Flashcard quiz, Morfo to practice their pronunciation and SOCRATIVE to set their own class activities. 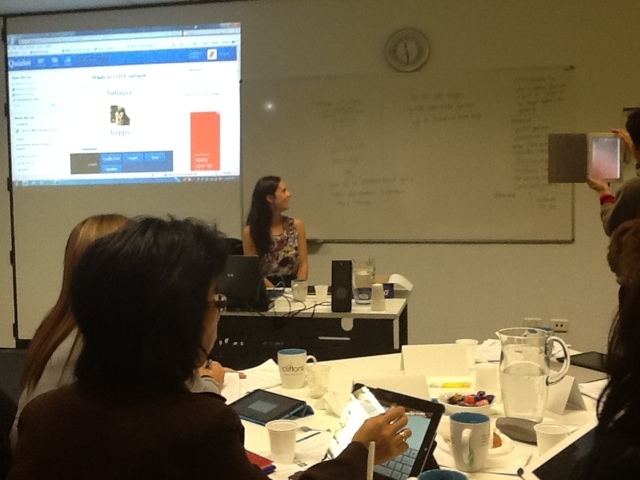 From talking to LOTE teachers during the PD they felt that using only iPads to teach LOTE was not sufficient. They believed that existing apps weren't good enough to use without support from trained teachers. ( I will investigate that ) I would like to continue with the trial for this half year and judge our results at the end of the trial. This morning I participated in Cybersafety professional learning provided by ACARA. I hope you can understand my notes typed during the PD on my iPad. I will be working hard to prepare my students ( and parents) for the challenges of the online world. There is a necessity to factor in the emotional development of the children. Cybersafety in the classroom can be incidental.- embedding Cybersafety issues into daily ICT usage rather than set piece lessons. Emphasis now on-How do we help children to 'manage' their devises safely? Problem solving skills and developing fine motor skills beginning very early especially with iPads. 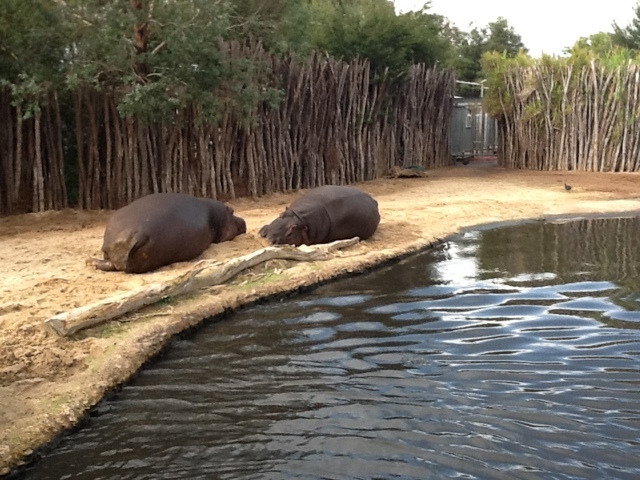 Peer pressure to have access- "Everybody else has got a phone". Don't be frightened by unwanted contacts but deal with it. Older siblings an issue - unwanted images and violent games on children's devices. Digital divide growing between young teaching staff and old teaching staff and between children and parents. Need to watch out for vulnerable and easily influenced children at school. Can be a learning experience not always causes major harm. Limiting online experiences may increase vulnerability. Apps have classifications and you can restrict apps downloads according to age. Keep a registry of apps that are purchased. Watch out for 'in app' purchases.You can block 'in app' purchases. Children always ask me first about such purchases. Instagram ( Issues with photos not private, Google images access photos and GPS location recorded in photos)Privacy settings need to be on. Whatsapp- phone, texting and video. Would You Do Me score website used for selfies. Snapchat- photo, text and video - photos don't disappear and can be extracted. Screen capture inappropriate text if an issue. Ask about settings on phones, iPads etc that can indicate your child's geographical location. Instagram can be set to private. Check out your restrictions menu on your device.Go to Settings on the iPad, iPhone. Facebook- go into security and login notifications and make sure the boxes are checked. Schools must ensure that they have a 'Safe schools framework' to refer too when Cyberbullying occurs. Children need to want to do something about Cyberbullying. Engage children in dealing with this issue. Let them come up with rules and penalties. Empower bystanders. ' How do you help your friends if bullying occurs?' Children are often worried about parent response- ' They'll take my phone away from me' if they tell anyone. they are more likely to talk to their peers which is why 'bystanders' are important in tackling a problem. Ken Rigby ( ACER Press) says that punishments don't work. 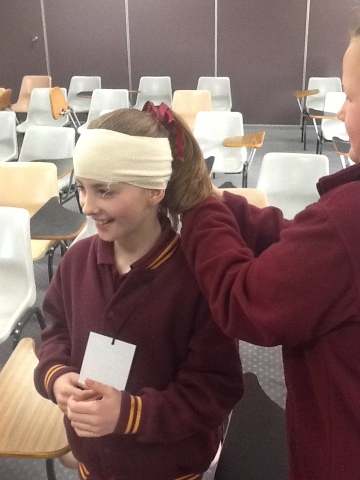 Use a child centred / peer response to the issue in the school. Mediation issues to consider. policies in schools need to be reviewed every 12 months. In the policy make sure you know what to do.Have stepped guidelines. Need for consequences and conflict resolution with follow-up included.Share ideas across schools. Every teacher in the school regardless of time fraction or what subject they teach needs to be involved. Victoria does not have Cyberbullying laws but we do have bullying laws. ( Brodies Law) Does it apply to schools?Discuss value judgements about Cyberbullying. teacher reaction to Cyberbullying important- Teacher counsellor has to be available at lunchtime. Positive bystanders- What is a students role when it comes to helping their friends being bullied. Kids Helpline 1800 number is an exempt number. sexting- mostly peer pressure. girls concerned about blackmailing. parental trauma to be considered.Easy to do, impacts on people's life- labelling. need to discuss healthy relationships, gender relationships and gender equality needs to be discussed. At Glen Park we will use Zipper's Astro Circus as an introduction to Cyber Safety issues with grade F - 2 and Hector's World for grade 3-4 and the How Cybersmart are You? Quiz and fun activities for grade 5-6. Cybersmart Detectives for grade 5-6 and Cybersmart Heroes for grade 6. 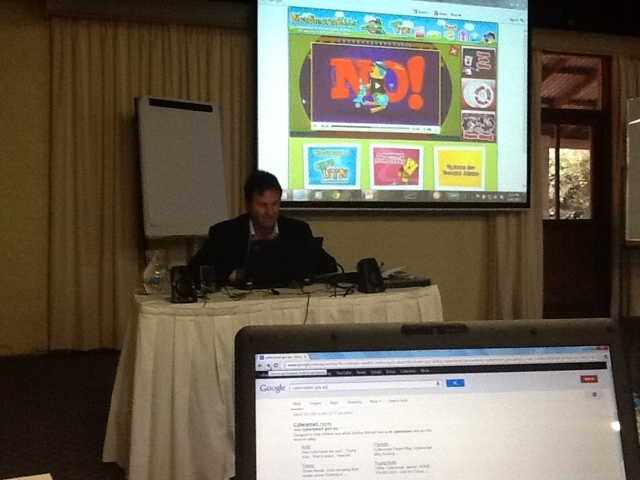 The 'Dandelion' app and book can be used as an introduction for Foundation to grade 3. Also consider 'Surf Swell Island' for grade F- 4 for a Disney approach and 'NetSmartzKids' up to grade 5-6. Teachers need to adhere to professional standards. Don't post information on teachers, children's, parents. Ensure postings align with ethical standards. Ensure privacy settings are set. Use your own personal blog for personal issues not a classroom or school blog.Don't have contact with students in social media sites. Issues to consider: Flipped classroom contains project based online tasks done outside of hours.Can you as a teacher be contacted outside of hours?Is that desirable? What are our responsibilities for outside of school hours activities? When it comes into the school it becomes OUR responsibility. Cover yourself with policies. Pre-empt risks in policies.Implementing the policy is more important that exact wording of a policy.Date and write comments accurately. Reports need to be impartial and fact-based.Make sure you write a 'follow up' to any actions and follow it up. Have the policy language directed toward children so they understand school policy in a language they understand.Find easy guidelines for Facebook and other social media sites and promote them. 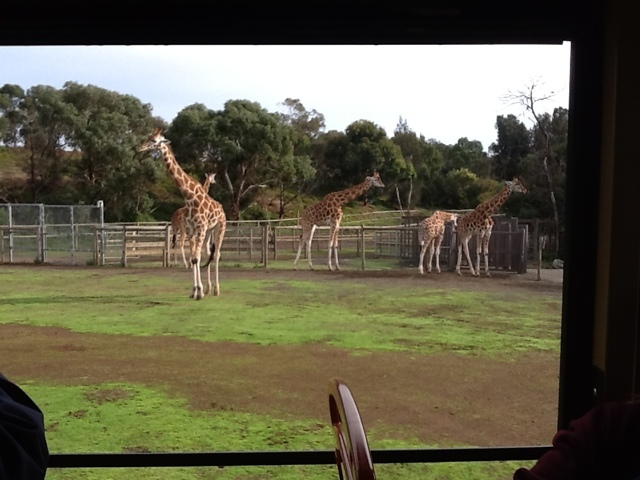 At Glen Park we will review our policy in light of this training and complete our eSmart school training in 2013. 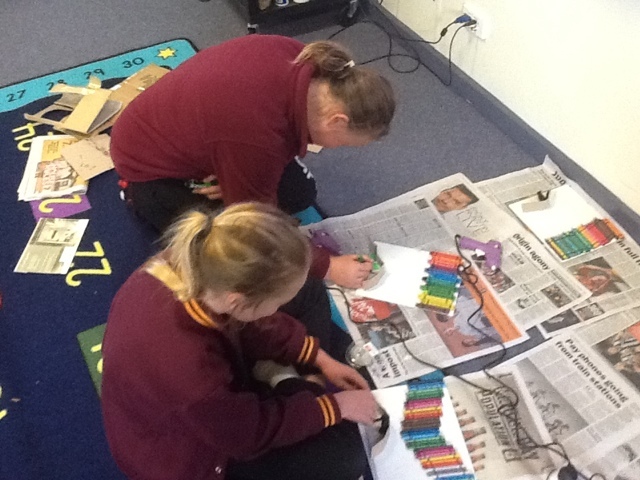 Suggest students produce their own materials to raise awareness about Cybersafety issues. provide time to explore online resources previously mentioned. 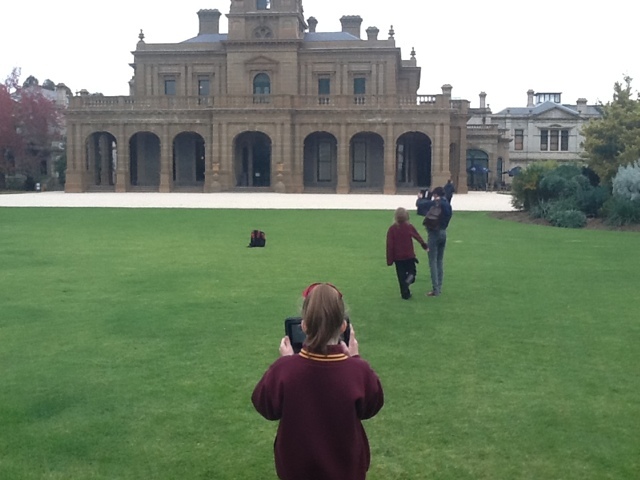 AusVELS ( Australian curriculum) implementation needs to incorporate the Cybersafety message across the curriculum. Consider peer mentoring and special days on cyber security. ( Cyber training/cyber nights for parents run by students?) Consider booking a student/ parent workshop run by ACARA.Also use 'teachable moments' using relevant news items for classroom activities or as newsletter. 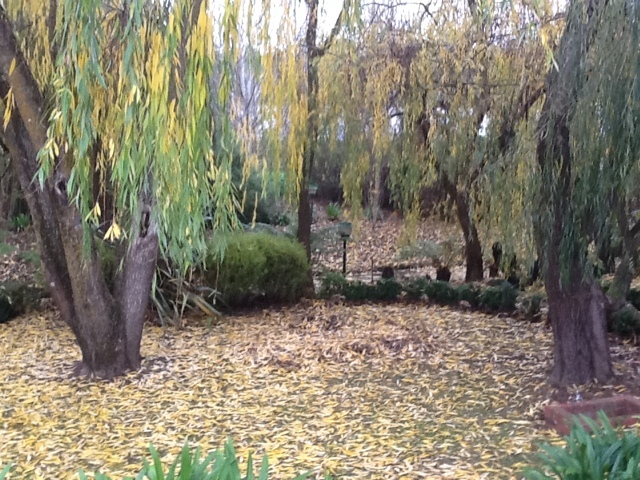 Photo from the PD and a photo of the garden at the venue I was at. 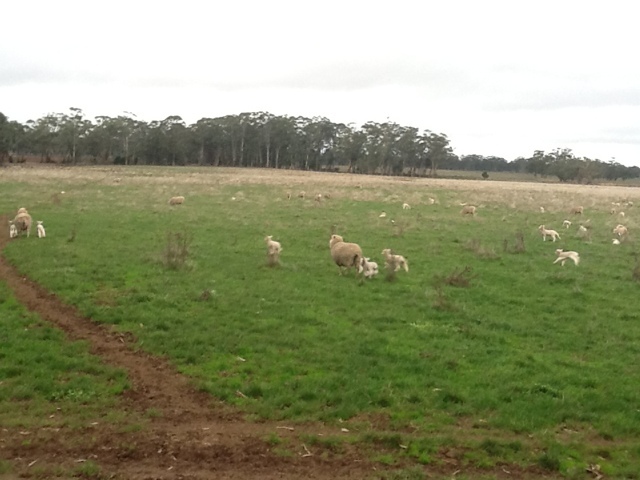 ALSO When I got back to school this afternoon I found some lambs on our side of the fence so I had to help them over. ( I guess it's true what they say about grass being greener on the other side.) 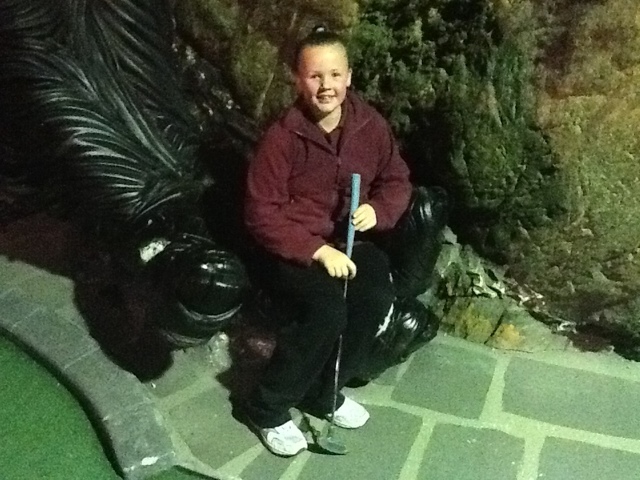 The kids had a new CRT ( Casual Relief Teacher) while I was away, Cherrie Cook who had a fantastic time with them. Winter has set in with a dreary, misty day keeping us indoors. 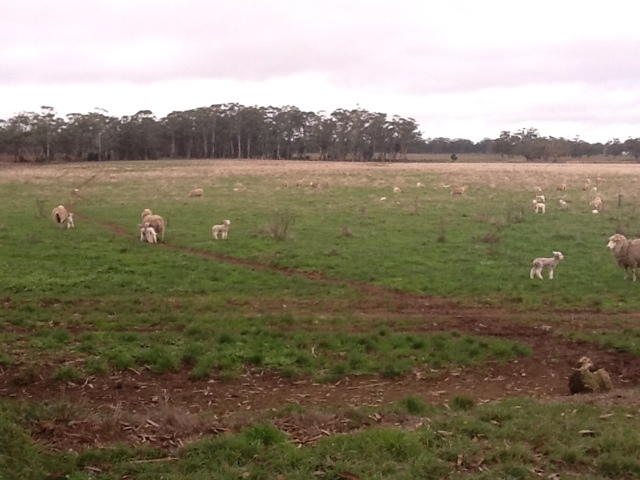 We were hemmed in today with sheep in one paddock and cows in the other. I feel sorry for the lambs. 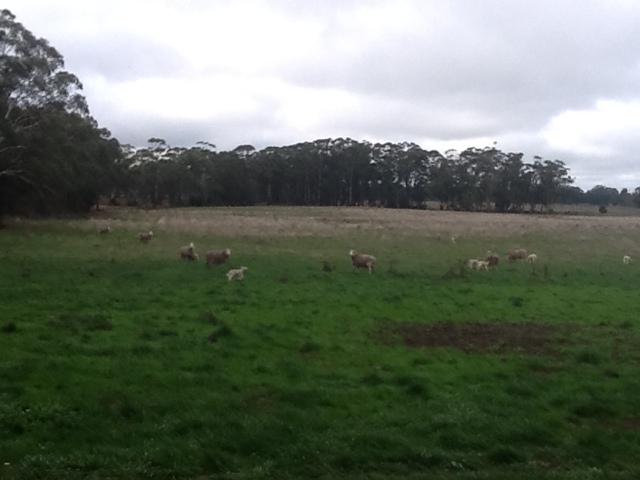 It is very cold and you can hear them prancing around, wagging their tails and bleating for their mums. The cows on the other hand just look surly. 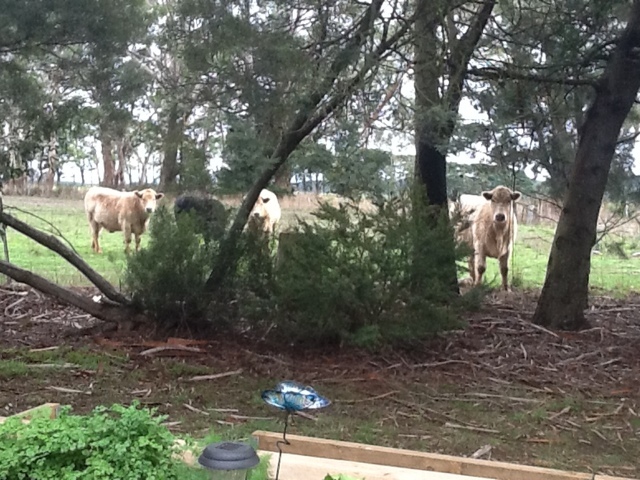 I'm sure they'd love to get over the fence and into our little veggie garden.I'll have to watch them. New Unit - KING KONG!